I remember a friend telling me to keep some activated charcoal on me. I guffawed at the idea, but now, years later, I carry this stuff everywhere I go, especially when traveling. Two caps and you can say good bye to food poisoning or bloating. But wait, there’s more. Turns out this natural supplement is a simple multi-purpose remedy for many things. This stuff works so well it’s frightening. For many centuries, ancient Ayurvedic and Chinese medicine used activated charcoal to improve intestinal health and soak up poisons. It has been used in western medicine in many different hospitals across the globe as a way to reverse exposure or consumption of poisons, booze, or drug overdose. Activated charcoal binds to toxins or poisons as opposed to absorbing them. It can be derived from several different sources, including charcoal, coconut shells, peat, and wood. However, when it comes to healing, it is best to choose activated charcoal that comes comes from natural sources, such as coconut shells. What’s the most important thing to remember when you take activated charcoal internally? Consuming enough water. Activated charcoal can cause dehydration if adequate amounts of water aren’t consumed in tandem. In addition, water helps flush out toxins and prevents constipation that can occur when taking charcoal. Activated charcoal provides a plethora of other amazing health benefits. I’ve personally used it to help combat my oily skin and help make my teeth whiter — it works wonders on both accounts. 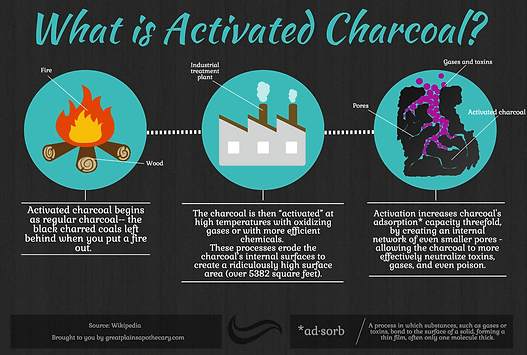 Here are some of the many ways that activated charcoal can be used. 1. Alleviates gas and bloating: We’ve all been there — we ate the wrong thing or too much of something, and our digestive tract becomes uproarious. Bloating and gas are often an ugly result. The American Journal of Gastroenterology conducted a study that found activated charcoal can effectively treat intestinal gas following a heavy meal. Activated charcoal binds to the toxins in fats and in the digestive tract, helping foods be processed without the body also trying to break down those extra toxins. This happens because it binds to the acids that cause indigestion, reflux, and bloating. So the next time you want to indulge in foods you know typically causes an unpleasant reaction, keep some activated charcoal around. One tablet after a meal will do the trick. 2. Cleans mold: It has been proven that the exposure to mold can have very harmful effects on our health. Toxic mold can cause a myriad of irritations that range from mildly inconvenient to downright dangerous. Mold can trigger eye irritation, headaches, weakened immune system function, and even heart disease. Moisture and poor ventilation can contribute heavily to the issue, as well. Mold is typically seen in spaces like the laundry room, basement, and bathrooms. A mixture of activated charcoal, baking soda, borax, and tea tree oil can be used in a blend and applied directly to help eradicate mold from various surfaces when applied directly. 3. Whitens teeth: There are so many over the counter products that promise a whiter, brighter smile, and while they may deliver, it often comes at a cost. So many of those products contain additives like fluoride that aren’t good for the body. If you are anything like me, you enjoy a good glass of wine or some juicy berries in your diet — all of which can be incredibly staining to your teeth. Activated charcoal is just the answer you’ve been looking for. Not only will it help give you the pearly whites that you’ve been longing for, but it will also help to prevent bad breath, gum disease, and cavities. Simply wet a toothbrush and dip it in the activated charcoal, then brush your teeth as you normally do. Rinse thoroughly. Be cautious of using around tile, grout, and counter tops: activated charcoal will stain! 4. Hangover prevention: If you’re going out for a night on the town or you have a big party to attend, you should be thinking about all that sugar contained in alcohol and the accompanying hangover you may suffer. But if you’re not, you may want to grab some activated charcoal. A study conducted at Princeton University stated that activated charcoal is administered in a variety of situations that deal with the consumption of alcohol as a way to prevent hangovers or even treat alcohol poisoning. Another study showed that blood alcohol concentration is mitigated extensively in the presence of activated charcoal. One tablet should be sufficient, taken before the drinking begins. Also, remember to drink enough water during your night out and the next morning. 5. Skin: If you struggle with oily skin, like me, activated charcoal may be just what you’ve been missing. It is known to target and disrupt the process of acne. Many over-the-counter masks have some form of activated charcoal in their ingredients. Due to its ability to bind to toxins and bacteria, activated charcoal can successfully lift impurities from deep within the skin. It also has a way of binding and safely ridding your skin of excessive oil. Using activated charcoal in a mask is ideal. Mix it with some aloe vera gel, clay, and tea tree oil, twice a week, and watch the way your skin starts to transform. 6. Reduces high cholesterol: Many of us are taking our health more seriously by cleaning up our diet and getting adequate exercise. However, when it comes to lowering bad cholesterol, that won’t quite cut it. Taking specific supplements and vitamins help aid the internal system in keeping our blood and lipids healthy. A study shows that taking activated charcoal will contribute to reducing bad cholesterol and increasing good cholesterol at nearly the same rate as certain prescription medications. Take it twice a day on an empty stomach. Just be cautious: don’t take activated charcoal within two hours of any other supplement or prescription medication, due to its primary function to absorb whatever may be in your system. 7. Detoxification: Activated charcoal does a tremendous job of cleaning out the gunk and grime that can fill up the digestive track. If you are the type of person that likes to jump-start a new eating plan with a cleanse or detox, then activated charcoal can certainly be the right tool. When taken internally, it can remove toxins that may lead to improper immune system function, oxidative damage, or even allergic reactions. When you remove the harmful toxins from your digestive system, your entire body will begin to work more optimally. You may experience less inflammation, more energy, and even a keener sense of mental acuity. It’s also a great companion when doing coffee enemas. When you are taking part in a detox, eat only clean foods such as organic fruits and vegetables, and wild fish. Also, make sure you eliminate refined sugar and consume enough water. It’s suggested to take about 10 grams of activated charcoal orally, 90 minutes before a meal. 8. Anti-Aging: The signs of aging may show up on the face, but typically the way our bodies and organs react to certain stressors is what causes aging to occur. Activated charcoal can flush many of the major organs of toxins that cause damage and eventually show up in the form of gray hair or sagging skin and wrinkles. Aging is a beautiful, regal aspect of life, and we should have a healthy relationship with the process. However, processed food, toxic environments, and chemicals can speed up the aging process unnecessarily — and this is where activated charcoal comes in. To promote a youthful glow and appearance, if you are exposed to heavy metals, non organic foods, or any other type of toxic material, taking a capsule of activated charcoal once a day, will reverse its harmful aging effects. 9. Alleviates Menstrual Cramps: Menstruation is a time when a woman’s body detoxes. One of the ways to avoid the painful symptoms many women experience during their periods is by helping your body to detox before your cycle. To make sure your body is properly detoxed, take two activated charcoal tablets a day, every day, for the week before your cycle is due. Similarly, the tightening and cramps that are often experienced during PMS and menstruation can also be alleviated with activated charcoal. 10. Poison Removal: As mentioned above, one of the primary uses of activated charcoal is to neutralize and remove poisons or chemicals that get into the system by ingestion. Dangerous substances such as fertilizer, chlorine, pesticides, and other toxins are inadvertently consumed. Thankfully, activated charcoal binds directly to the surface of the chemical for incredibly quick elimination; this helps to prevent any absorption in the body. A crucial component to this remedy is ensuring proper dosage. A University of Michigan study states that 50 to 100 grams is used in cases of the poisoning in adults — this is not to be confused with milligrams. 11. Water Filtration — The quality of the water we consume is incredibly important to our health. There are so many impurities that make their way into our water, despite the steps we may take only to consume fresh, untainted H2O. Interestingly enough, activated charcoal is used in many water filtration systems, since it’s so effective at removing impurities and toxins. The Journal of the Canadian Dental Association states that activated charcoal can remove fluoride, a component that isn’t conducive to immune system functioning, oral health, and a healthy liver. Make sure you research for the best counter top filtration faucet with activated charcoal to make tap water safe to drink. The necessity of water and obtaining adequate hydration is vital as pure water helps fight fatigue, clears skin, and soothes the digestive tract. Serene Hitchcock has been writing for several years in many forms and facets. She loves the written word and a well-executed story. She’s interested in the arts, health, current events and the world we live in.